All right, guys. You were so nice to me the last time I told you a bookish secret, and I've got another I need to unload. Me: What's the latest about? Him: Musical of Much Ado About Nothing. Him: Nice, but... how have you not read Shakespeare? You of all people? Me: Dude, you've got me. I don't know. I really don't know. Everyone and their mother had to read at least a handful of his plays in high school, but Shakespeare apparently wasn't on my district's list of priorities. (Not kidding about the moms: even my mother ragged on me for never having read Shakespeare. If any of you are my Facebook friends, you know how much she loves me, and this gave even her pause.) It's possible I read all of Taming of the Shrew in freshman or sophomore year, but I also may have read only excerpts. I don't remember—how much I read and what it was even about—and therefore I don't count it. I haven't done a ding-danged thing to change this situation, and part of me doesn't especially care. 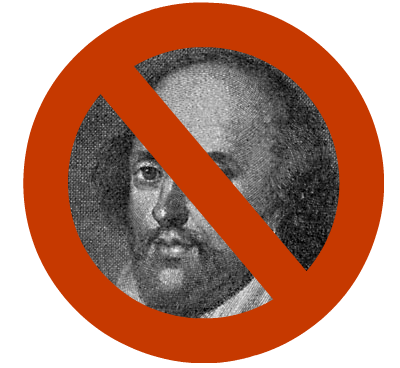 Katie's post about not having read the classics fostered a great discussion about how we shouldn't feel "guilty" about what we have and haven't read or feel forced to read what we don't want to. I wholeheartedly agree, and yet I do connect with her point about how often these works get referenced and reinterpreted across literary genres. I know my reading experiences might be more nuanced and satisfying if I had some of the bard under my belt, but honestly? I don't even know where to begin, it's intimidating, and I've got so much other reading to do. So, again, I turn to you, dear reader. Is Shakespeare all that and a bag of chips? I have Macbeth on my aforementioned Classics Club list, but is that the best place to start? I've heard his plays are easier to digest when read aloud (meant to be performed and all that), so should I break my no-audio book and no-Shakespeare streak at the very same time? Let me know. I'll be here, probably reading anything other than Shakespeare. Do you have a bookish secret you'd like to spill?